Ookbee which happens to be the largest online ebook store in Thailand is in an overdrive with major expansion plans being worked out. That is hardly surprising, considering every ebookstore around the world worth its salt is busy charting their own growth strategy. However, what has made things a bit sticky for Ookbee is that their keenness to have a bigger presence in the world ebook scene has pitched them against its own partner companies. While competition is healthy and promotes growth, for Ookbee, there does exist the risk of things getting ugly. 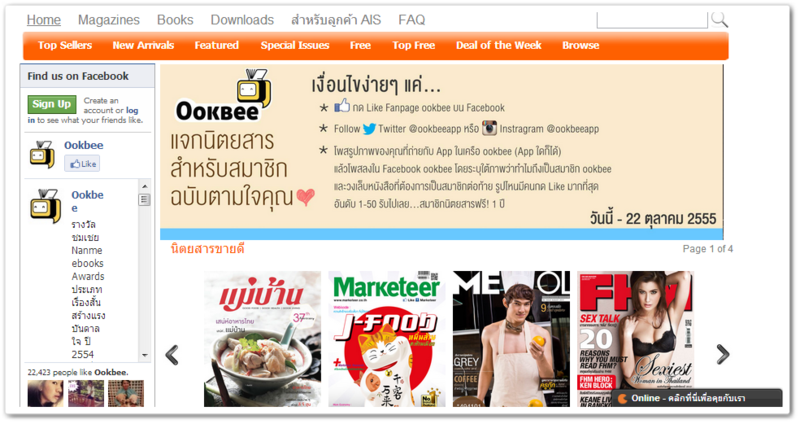 Now Ookbee has to its credit the lions share – read over 90 percent – of the Thai ebook market. It also has presence in Vietnam and Malaysia. The company had recently released an iOS app and hopes to launch an online subscription based Netflix-Style-real-all-you-can Ookbee Mee service soon. It shares a business relationship with B2S and AIS though all of their recent ventures have brought them head to head with its partners than being on their sides. From what seems evident is that it seeks to have a more active role to play in the ebook business rather than being on the sides lines with other calling the shots. What remains to be seen is whether Ookbee’s partners too are thinking along the same lines.